Where do we turn for the latest updates on digital technology? Magazines, of course! But with so many out there, which one suits your needs? Here Alan Geere offers his views on six titles for InPublishing. What’s it about: ‘Reviews, Advice, Projects, Opinion, News’ – tagline under masthead. Vital statistics: January 2018 issue: 140 pages of 296mm x 209mm. Matt paper, heavyweight gloss cover, perfect bound. £4.50 cover price. Combined ABC of 15,177, with 337 from digital. Published monthly by Dennis in London. Cover: One big headline with a rather clunky graphic and four tick boxes, four other coverline cross-refs and a tiny picture of Christmas presents although it’s the January issue. Content: Contents across pages 4 and 5 with a neatly annotated cover so readers can see where’s what. Letters up front followed by what passes for news in the tech world. Reviews of smartphones, PCs, laptops, monitors and even a £35 printer (sorry, ‘multifunction peripheral’) run to 50 pages and are detailed, full of technical info plus those expert opinions that we are paying for. Features, group tests and a section called ‘Learn’ round off a comprehensive offering. Digital: No easily visible digital links so don’t get confused with the fully-functioning Ziff Davis website that is lurking at the obvious address with .com. The .co.uk version is just a subscription page with a link to Twitter where 53 tweets and 206 followers tell their own story. What they say: “Tech journalist, fan of Spurs, sunshine, Game of Thrones and cats. But not necessarily in that order.” – editor Madeline Bennett announces herself on Twitter, and shows up the mag with 5,614 followers. Verdict: Lots and lots to devour. Smallish type and not many pictures make this a grown-up, absorbing read. 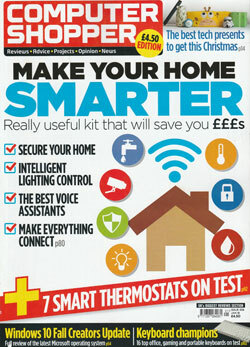 The cover story on smart homes is worth the entrance fee on its own. But clearly no appetite for digital, which feels a bit perverse given the subject matter. What’s it about: ‘Technology in your hands’ – tagline under masthead. Vital statistics: Launch issue December 2017: 132 pages of 275mm x 210mm. Quality gloss paper, card cover, perfect bound. £6 cover price, but free as a download. Published monthly by Raspberry Pi in Cambridge. Cover: Masthead is biggest item on view followed by a cover story package, six other coverlines, one mug shot and straplines top and bottom made up of key words like ‘build’ and ‘duct tape’. All delicately coloured – and a spot varnish red butterfly. Content: Contents spread takes creativity to a new level, divided into Spark, Lens, Forge and Field Test, only one of which is clear from the descriptor. Hackspaces – ‘community-run groups that enable people to share access to tools and collaborate on projects’ – are an eclectic mix by the look of this content. All the way from how to make a wooden trebuchet to Tinkercad Circuits vs Fritzing and everything in between. Digital: A neat and tidy website has plenty of the magazine content if you delve around for it plus the obvious subscription info. Links to Facebook (470 likes) and Twitter (1,962 followers); passable numbers given it’s only just launched. 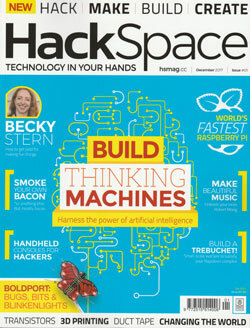 What they say: “My opinion is that Hackspace is clearly a generic term in trademark law, and our limited funds and time would be better spent reinforcing this than filing a trademark application which is likely to be denied or attacked.” – contributor to the Hackspace Foundation (no relation) forum discussion on the new magazine’s name. Verdict: A bold innovation from the single-board computer people who want to raise the profile of the hackspace movement and put any profits back into the Raspberry Pi Foundation charity. Whether there are enough hackspace devotees out there to support the venture is open to debate. Whether there are enough ‘simply interested’ people is probably the question to ask. What’s it about: ‘For all your Apple needs, for 22 years’ – explainer on Twitter page. Vital statistics: December 2017 issue: 108 pages of 295mm x 210mm. Quality gloss paper, heavyweight cover, perfect bound. £5.99 cover price. Combined ABC of 23,021, with a very impressive 9,387 from digital. Published monthly by Future in Bath. Cover: Lots of words in different colours making up nine coverlines, two phones, three computer screens and a thermostat (don’t leave home without one). And the price (a hefty £5.99) in the smallest type you ever did see, about three point in old money. Content: Brash contents spread (pages 6 & 7) has big type, three screens and so many mentions of ‘Apple’ and ‘Mac’ that you can’t possibly forget where you are. Apple ‘Core’ is pages of bits and pieces followed by an investigation into Face ID. Letters, opinion and then into features on smart home thermostats, clean up your Mac and a lovely skills section showing you how to actually do stuff. All finished off with an invaluable buyer’s guide. 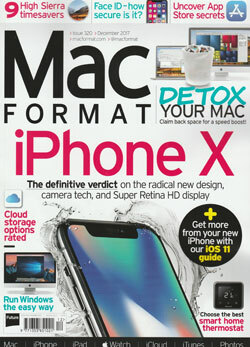 Digital: Website – macformat.com – signposted from the cover, but immediately bounces into Future’s subscription site, myfavouritemagazines. Twitter bubbling along with 12.3k followers, and 15.6k likes on Facebook. iPad edition available from iTunes, although readers of a nervous disposition should avoid the customer reviews. What they say: “Does anybody know for sure if the Apple Watch 3 works with the iPhone SE?” – editor Graham Barlow does his product research via the wonderful world of Twitter. Verdict: In true Apple tradition, everything is displayed in a very approachable way, with every page inviting readers to dip in. Maybe suffers from not having anything very meaty but who needs protein when there’s plenty of carbs? 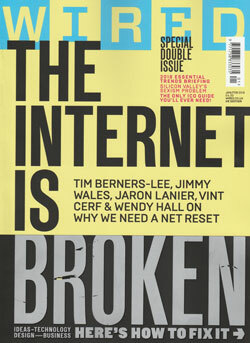 What’s it about: ‘The voice of web design’ – tagline over masthead. Vital statistics: January 2018 issue: 100 pages of 289mm x 222mm. Matt paper, heavyweight gloss cover, perfect bound. £5.99 cover price. Combined ABC of 12,703 up to December 2016 but now ‘no longer registered’ with ABC. Published monthly by Future in Bournemouth. Cover: A work of art involving spot varnish and hidden icons that appear like holograms. One big headline, six other coverlines and some suitably futuristic graphics. Mainly black with complementary pinky-red. Content: Dynamic contents spread gives a good taste of what’s ahead with headings such as ‘Feed’, ‘Voices’ and ‘Projects’. Lots of bite-sized reads up front, including a very informative Q&A with experts, then into longer pieces in wide range of topics, and not all of them techy. ‘Inspirational sites’ and ‘design challenge’ both deliver what’s promised in the title. Some even longer profiles do their subjects more than justice. Digital: Website hangs off the side of Future’s ‘Creative Bloq’. Lots of content nestling between the Starbucks ad. Has a lively Twitter presence (97.2k followers) and Facebook page (95k likes) despite an understated promotion in the magazine. Also has 22k followers of their page on medium.com, looking at content mostly posted by a former editor. What they say: “75 per cent of readers are working in or seeking work in the web industry,” – advertising account director Chris Mitchell makes his pitch for customers in the ‘Hosting Partners’ classified section. Verdict: Plenty for both the web developer expert and those simply a bit interested. All put together with Future’s customary verve and adventure. Light on ads once the in-house promos are discounted, which is surprising given the innovative nature of the web design business. 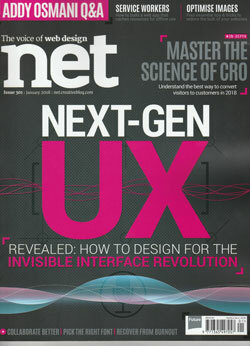 What’s it about: ‘The UK’s best magazine for everyone who loves technology’ – boast on Twitter. Vital statistics: January 2018 issue: 132 pages of 296mm x 209mm. Matt paper, gloss card cover, perfect bound. £4.99 cover price. Combined ABC of 24,232, with 1,321 from digital. Published monthly by Dennis in London. Cover: Main headline package, four other coverlines, picture of a chip (computer, not potato), a chained-up laptop and five little ‘Gifts for grown-ups’. Content neatly encapsulated on the spine for the well-kept bookshelf brigade. Content: Three pages of contents in quite small type give taste of the feast ahead. Some news than four incredibly helpful pages of ‘The A-list’ where editors pick the best products on the market. A thoughtful piece on the positive effects of social media, a how-to on video editing and a bumper reviews section indicate just what an all-round good read this is. Digital: Twitter (21k followers) and Facebook (5.7k likes) links on the top of every page but more difficult to find the website. 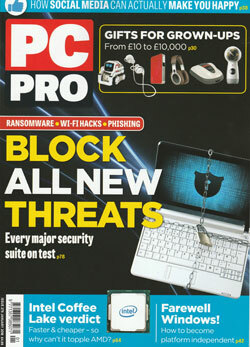 Put in the obvious pcpro.co.uk and you are thrown into alphr.com, Dennis’s all-encompassing technology site. There’s another page with subscription info and a page on the Dennis corporate site but nothing with any meaningful content. What they say: “From the bean-to-cup coffee machines to the fantastic view from the 6th floor, Alfred Place offers a flexible and agile way of working across the whole business.” – bigging up the new offices in Bloomsbury for potential new recruits. Verdict: Now a venerable 23 years old, PC Pro still packs a punch, even if the much-anticipated cover-mounted CD/DVD has been discontinued. Informative, polished and surprisingly accessible for a magazine aimed at experts. Constrained by Dennis’s digital-second approach, but still works hard with social media. What’s it about: ‘As technology disrupts every sector and area of our lives, WIRED cuts through the noise to deliver insight, intelligence and information’ – from the media pack. Vital statistics: Jan/Feb 2018 issue: 174 pages of 275mm x 203mm. Quality matt paper, heavyweight cover, perfect bound. £4.30 cover price. Combined ABC of 51,006. Published monthly by Condé Nast in London. Cover: A big headline incorporating a subdeck and five big names in the tech world, two other coverlines and a block of yellow making up for no illustrations. Content: One rather spare contents page hidden amongst publisher’s guff, contributors’ details and, of course, ‘From the Editor’. They are rather underselling themselves as there’s plenty to enjoy from ‘Gear’ (reviews) through ‘Work Smarter’ and features on subjects as diverse as cover story ‘Is the internet broken’ to Toyota transforming the auto industry and their annual ‘trends briefing’. Digital: Invitation to view the website is on the cover and leads to an orderly experience with less design and typographical trickery than the magazine. ‘Follow’ to Facebook (111k likes) and Twitter for 274k followers as well as YouTube and Instagram. Verdict: Works hard to fulfil its thoughtful, sophisticated remit and is largely jargon-free for the lay readers. As delightfully produced as to be expected for a Condé Nast publication helped by a distinctly non-techy assortment of plush advertising for cars, fragrance, airlines and watches all crammed in at the front.